Setup Area: Requires table and suggested canopy tent for safety. 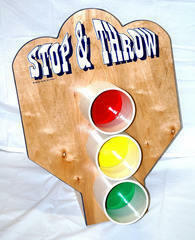 Stop And Throw with red, yellow, green bean bags/balls to toss into the correct colors. Game suitable for very young through adults. Also used as a rebound game for older kids and adults. Requires table and suggested canopy tent for safety.